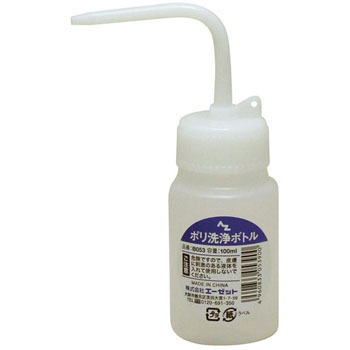 Fine Wide Mouth Wash Bottles B II Type P.E. This review is about item#58407456. The borrow of the vine was as shown in the picture, so it was convenient to use. Previously another Borl had a bent turn in the vine. This review is about item#58407474. When ordering the same two items, the nozzle shape is different (sideways and downwards) arrived. In my case there is no problem in usage but those who place importance on the direction of the nozzle need attention. The hook hole for hanging is attached to the lid part, it is very convenient at the time of storage and arrangement. This review is about item#58407465.